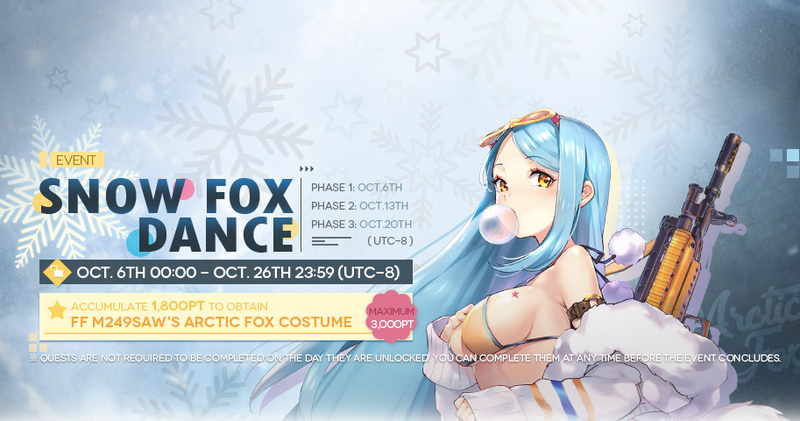 This is the data-mined phases by community members for the up coming event: Snow Fox Dance. [Thanks to u/Yorizura for Helping again once more.] Again we will have to see if the missions are as is until event is launched officially, but so far previous datamined works has been accurate. Another irregularities that is new to Point Events: Spending Tokens are straight up 1st week on the list! This probably coincides with launch of new costume releases and wondering if there will be a new dolls being released on 2nd week as we see our usual Produce x-star T-dolls missions. Only time will tell.